I had been thinking of buying a Swiss ball for my own personal home use for quite sometime. Finally, I bought one for RM59 last Wednesday from a sports store. 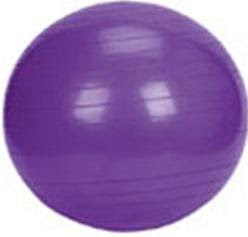 It’s a 55cm NordicTrack ball that comes in the colour lilac, one of my favourite colours. Today, I inflated the ball and move around with it- much to the amusement and curiousity of my doggie. As I am typing this post on my laptop, I am sitting on the ball and trying to hold my posture upright, and attempting a few balancing act such as moving from side to side, trying to balance on one leg, etc. At the same time, also listening music from my playlist in YouTube. Having the Swiss ball is quite fun- you can roll around, do some balancing exercises such as the plank and push ups (with your legs on the ball and your arms on the floor). Instead of watching TV and munching something, you can roll around and try to balance on the ball while your eyes is on the TV. I will try to obtain more videos of using the Swiss Ball from YouTube and Videojug soon.